Just Romantic Suspense: Am I still having fun self-publishing the romantic suspense ALPHA ebook series? Am I still having fun self-publishing the romantic suspense ALPHA ebook series? Carole Mortimer has been writing romance novels, contemporary and Regency, since 1978. She had written almost 200 books for Harlequin Mills & Boon, and a further 4 books in her own ALPHA series have been published this year. The ALPHA series is scorching hot romantic suspense. She is a USA Today Bestselling Author and a Recipient of the Romantic Times Pioneer of Romance 2014. She was also recognized by Queen Elizabeth II in 2012, for her ‘outstanding service to literature’. In late March I received some amazing news—Romantic Writers of America awarded me the Nora Roberts Lifetime Achievement Award 2015, to be presented to me in New York in July! They had a difficult time telling me about it too—I was away on holiday at the time, and was off internet connection over the weekends, but they finally managed to track me down and tell me the wonderful news. I can’t thank them enough for this wonderful honor, I still wake up every morning wondering if I dreamt it! It seems incredible that May 17th saw the release of Midnight Alpha, the 4th book in my bestselling ALPHA series. 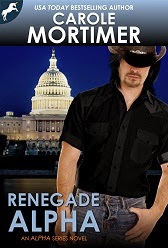 The pre-order for the 5th book, Renegade Alpha, is also available on my website and all ebook sites. Is my world still as frenetic and busy as it was when I first started publishing the series back in November 2014? But in a good way. I now understand the process of self-publishing so much more than I did when I first began the Alpha series just seven short months ago, and I can do virtually everything needed myself now—something I’m very proud of, and which my six sons are amazed at. Mainly because I used to be a complete Luddite; if it had a plug on it then I didn’t want to know! I can’t get away with that nowadays, and I don’t want to. So many people have asked if the series will be published in book form, and I’m pleased to say this will be happening very soon. The third book in the series, Shadow Alpha, was my 200th book, and hopefully this will be in paperback by the summer. There continues to be an ALPHA ebook published every two months, and in November I intend to also start writing a Regency Novella series—again this series will be scorching hot, so be warned! I’m still writing for Harlequin Mills and Boon as well as publishing my Indie books, have the second trilogy of the Dangerous Dukes for Harlequin Historical being released July/August/September this year, plus I’m also writing a Harlequin Presents trilogy due to be published in 2016. Life is busy, with both my family and my writing, and that’s just the way I love it to be. A link for signing up for my monthly newsletter, for news on Carole Mortimer and current and future publishing dates and titles of books, can be found on my website and also on my Facebook page.